The pituitary gland is a very important but small piece of tissue located at the base of the brain. This tissue is referred to as a gland because it secretes hormones into the blood stream to control essential functions of the body, including reproduction, growth during child development and the function of the thyroid. The pituitary gland is arguably the most important gland in the human body because it does so many things at one time. Most glands secrete one hormone, so the pituitary is unusual due to both the complexity of its function and its unique location in the brain, just behind the nose. Not only does the pituitary gland secrete six different hormones, some of these hormones control other glands—including the thyroid—so alterations in the function of pituitary gland can seriously impact an individual’s health and wellbeing. Hormone imbalances, whether originating from the pituitary gland or another area of the body, are typically treated by endocrinology. Endocrinology is the medical specialty that treats hormone issues, including pituitary problems and other hormone issues such as diabetes. The most common type of pituitary tumor is the pituitary adenoma, a non-cancerous tumor that forms on the pituitary gland. There are other types of tumors than can form, but the adenoma is by far the most common. Pituitary adenomas are categorized in multiple ways. They are benign (non-cancerous), invasive adenoma, or cancerous. The tumor may be a secretory tumor, meaning the tumor secretes hormones, or it may not. They are referred to as macroadenoma if they are a centimeter or more in size and are considered microadenoma if they are smaller than a centimeter. There are other types of tumors that can occur at the pituitary, but most are rare and surgery is performed in a similar way to the procedures that treat adenomas. Pituitary tumors are often diagnosed after a seemingly unrelated problem leads to the diagnosis of this type of brain tumor. For example, a young woman who has never had a child may begin to produce breast milk and lab results may point to a pituitary tumor as the cause of the problem. That said, many pituitary tumors are referred to as “incidentalomas” when they are found not because of symptoms or problems, but during a work up for something else. In this case, a pituitary tumor might be found during a CT scan of the brain being done because the patient went to the emergency room for a possible stroke. In this case, there were no issues or symptoms due to the adenoma, and it may have never been found if the CT scan had not been done. Acromegaly, a condition caused by too much growth hormone after most individuals stop growing, leading to very large hands and feet, and if not treated, coarse facial features. When too much growth hormone is produced during the adolescent years, gigantism—extreme height—may result. Cushing’s syndrome, a condition that can be caused by too much ACTH from the pituitary, often causes a round face and a hump between the shoulders. Pituitary adenomas are extremely common, with as many as one in six patients having a small adenoma present in the pituitary gland at some point in their life. Luckily, an adenoma that causes health problems is far rarer, with approximately one pituitary adenoma per thousand causing symptoms. Many patients with a pituitary adenoma or other type of benign tumor are able to avoid surgery. For patients who have a pituitary adenoma that is not causing problems and requires no medication, surgery is an unnecessary treatment. Other patients are able to avoid surgery by taking medication that controls the hormonal changes caused by a pituitary tumor. The individuals who are most likely to need surgical intervention are typically the ones who do not respond well to medication, or are having significant problems due to the tumor. These problems can include a change or loss of vision, severe headaches, or other health issues caused by hormone imbalances. In addition to the common risks associated with surgery and the risks of anesthesia, surgery to remove a pituitary tumor carries unique risks. The most severe of these risks is severe hormone imbalance caused by damage to the pituitary gland during the procedure. Damage to the gland can impair any or all of the six hormones secreted by the pituitary gland, and can lead to complex issues that can cause health issues in many areas of the body. Diabetes insipidus: Caused by a hormone imbalance, this condition causes the body to produce very large amounts of urine, leading to dehydration, thirst, and, in severe cases, confusion. Spinal fluid leak: It is possible for spinal fluid to leak from the nose after transsphenoidal surgery. This is because a hole is drilled into the bone behind the nasal cavity to allow surgery to be performed. If the sterile glue used to “patch” the hole doesn’t completely fill the area, the patient will experience a dripping nose, much like the clear mucus that is present with a cold. Sinus headache: A headache after this type of surgery is very common, and is often described as being like a sinus headache. Nasal congestion: It is expected that the nasal passages will be congested after this procedure, and this congestion is often present for a week or two following the procedure. In most cases the congestion will improve steadily in during recovery period, and is usually the result of the surgical instruments irritating the delicate tissues inside the nose. Meningitis: A brain infection is more likely to occur after brain surgery, as surgery increases the risk of bacteria reaching the brain. Prior to surgery on the pituitary gland you can expect to have a CT scan, MRI, or possibly both done to evaluate the size and shape of the gland and the tumor. Lab testing will also be part of the diagnosis of the issue, and many of those lab tests may be repeated prior to surgery if the tumor is causing hormonal imbalances. These pre-surgery labs will establish a baseline for comparison after the surgery is completed, and can help determine if the surgery has resulted in an improvement. Surgery to remove a pituitary tumor is typically performed by a neurosurgeon, a surgeon specializing in the treatment of disorders of the central nervous system, which includes the brain and spine. In some cases, an ENT (ear, nose, and throat) surgeon may be the surgeon or part of the team performing the surgery. The surgery is performed under general anesthesia, which is given by an anesthesiologist or a nurse anesthetist (CRNA). Due to the unique location of the pituitary gland within the skull but outside the brain, there are two ways the procedure can be performed. The most common way a pituitary tumor is removed is the transsphenoidal approach, where the surgeon inserts instruments through the nose and a hole is made in the sinus that rests between back of the nose and the brain. Placing a small hole in this bone, called the sphenoid bone, allows direct access to the pituitary gland. To be clear, the pituitary gland is attached to the brain, but rests on the underside of the brain. This allows the gland to be accessed via the nose. The procedure uses an endoscope, a flexible thin tube with a light, camera and small instruments inside. The endoscope is inserted and the surgeon is able to watch the images on a monitor. Tiny instruments inside the scope are used to cut the unwanted tissue away. In many cases, high quality scans taken prior to the surgery combined with specialized equipment used during the procedure help guide the surgeon to the most direct route to the pituitary gland. Once the path is open, small instruments called curettes are used to remove the unwanted tumor tissue. 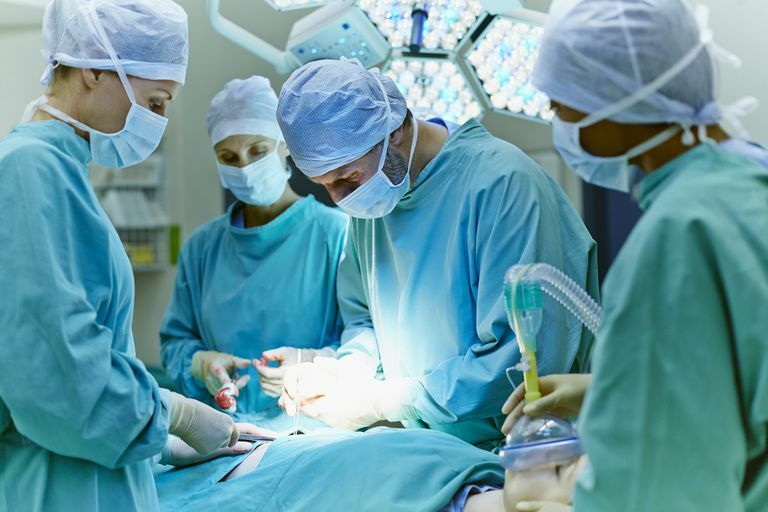 Once the tumor tissue is removed, small piece of abdominal fat is placed in the area where the tumor was removed, and the surgeon will seal the hole made in the bone with a bone graft, sterile surgical glue or both. In most cases, the nostrils will be splinted open to prevent swelling from completely closing off the nasal passages. The alternative approach to pituitary surgery is through a craniotomy, where a section of the skull is removed to access the brain directly. This route is far less common, and is typically used if the surgery is not the first to be performed on the pituitary gland. It may also be used if there is an issue with leaking cerebral spinal fluid after an initial procedure on the pituitary gland. During this type of pituitary surgery, the procedure begins after the area where the incision will be is shaved of hair and a metal device is placed near the temples to keep the head completely still. An incision is made in the scalp and the skin opened to expose the skull where small holes called burr holes are drilled into two areas of the skull. A saw is then used to connect these two holes, creating a melon wedge shaped piece of bone that is gently removed and set aside during the procedure. The covering of the brain, called the dura, is opened and the brain is able to be seen. Once the brain is exposed, a special suction device is used to gently lift the brain allowing access to the underside of the brain where the pituitary gland rests. The surgeon can directly visualize the gland and can operate using instruments held in the hands. Once the procedure is complete, the piece of skull is either replaced and held there with glue or it is kept in a special freezer so that it may be replaced at a later date. The skin of the scalp is closed with staples or glue. Most patients will spend a day or two in the neurological or surgical intensive care for close monitoring after surgery. During that time the staff will pay particular attention to blood tests to determine if the surgery was successful at reducing hormone imbalances, and will also closely monitor urine output to determine if the surgery has caused diabetes insipidus. You will also be monitored closely for postnasal drip or a runny nose, which can be a sign that the patch to close the hole in the sphenoid bone didn’t completely contain the cerebral spinal fluid. After one to two days in ICU, the patient can be transferred to a step-down or floor unit at the hospital. Most patients are able to return home 3-5 days after surgery with strict instructions not to blow their nose and instructions on how to care for the incision on their abdomen. Most patients are able to return to the vast majority of their normal activities two weeks after surgery. Some activities that can increase intracranial pressure (pressure within the brain) such as weight lifting, strenuous exercise, bending, and lifting must be avoided for at least a month after surgery, but activities such as working at a desk, walking and driving are usually possible at the two week mark. For the initial weeks of recovery is it typical for prescription medication to be given for surgical pain. Additional medications are often given to prevent constipation, as bearing down to have a bowel movement can also increase intracranial pressure and should be avoided. You may receive medicine to reduce nasal congestion and swelling. During this time, it is normal to experience fatigue, nasal congestion and sinus type headaches. It is important to report the following to your surgeon: postnasal drip or runny nose that does not stop, fever, chills, excessive urination, excessive thirst, severe headache, and a stiff neck that prevents the chin from touching the chest. Your follow up visits may with your neurosurgeon, ENT or both. You can expect to have blood tests done to continue to follow your progress and to determine what medication you will need, if any, once you have healed. Neurosurgery: What Exactly Does It Mean?